Between 1330 and 1400, the fire was making small runs in the grass with upcanyon winds and backing downslope into the main Cramer Creek drainage with low flame lengths. H-1 was being pressed by fire. By 1400, the shortwave disturbance had started to move into central Idaho. This brought increased windspeeds and a strong flow from the northwest that began to overpower local diurnal winds. Fire activity began to increase dramatically over the entire fire, as well as on other fires in the area. Winds were reported as “whipping back and forth,” and a large brown smoke column formed west of H- 1. 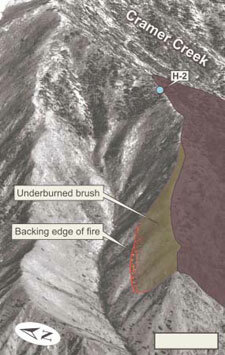 The fire burned with increasing intensity, moving east and downslope with stronger winds, overrunning H-1. 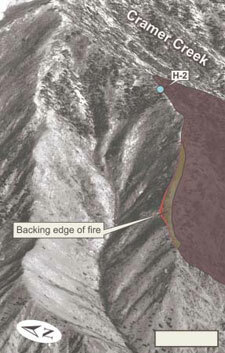 To the west, fire continued to back down below the West Ridge into the Cache Bar drainage. With hot conditions, increasing winds, and dried, preheated foliage from the backing fire, the smokes began to transition to an active fire front between 1430 and 1440. The general winds were overcoming local diurnal winds in the canyon. 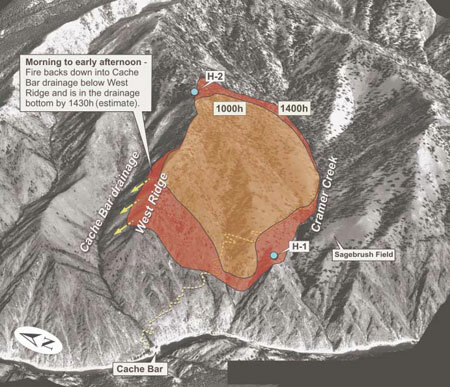 Although the ridgeline between Fountain Creek and the Cache Bar drainage sheltered the bottom of the drainage from the northwesterly winds initially, the shift to a more westerly flow aligned with the eastwest orientation of the Cache Bar drainage, and overall updrainage windspeeds began to increase. 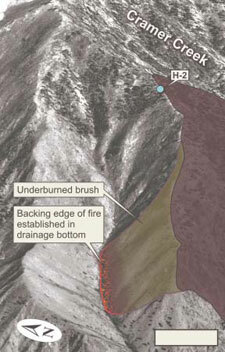 The fire in the Cache Bar drainage was building simultaneously to the fire buildup in Cramer Creek. See figure 23 for estimated perimeter growth and figure 24 for estimated backing spread into the Cache Bar drainage. Figure 23—Cramer Fire perimeter and spread on July 22, 2003, by 1430 (estimate). 0830–0850: Smokes seen below West Ridge. down to midslope below West Ridge. down to lower portion of drainage. Figure 24—Fire spread estimates from backing and rollouts into the Cache Bar drainage.